Unsold EUR 60,03 Buy It Now or Best Offer, EUR 30,30 Shipping, Pay with PayPal and you're fully protected. 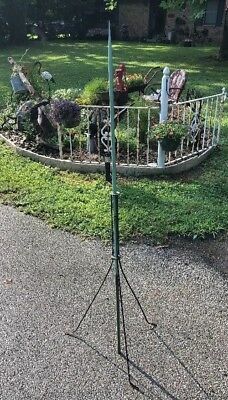 Seller: midwest_pickers (3.474) 99.6%, Location: Greentown, Indiana, Ships to: US & many other countries, Item: 163163688590 Really nice antique copper lightning rod with original 3 legged base stand. Rod measures 61” long. Nice condition with no bends or breaks. Point is excellent. Appears to be the original length. Base is also in good condition. Ready to use or for display. I’m also listing 80’ of copper wound lightning rod cable in a separate listing. If you have any questions about shipping or item please contact us before purchasing. ALSO, PLEASE CONTACT US PRIOR TO OPENING A CASE WITH EBAY IF YOU ARE NOT SATISFIED WITH YOUR PURCHASE. There is a good chance we can settle any issues you may have. WILL SHIP OUTSIDE THE CONTINENTAL US USING THE GLOBAL SHIPPING PROGRAM ONLY. Buyers outside the continental US pays extra shipping charges. NO PO BOX. Even though I normally put standard shipping your item will usually ship First Class or Priority Mail unless shipping cost it to expensive. I strongly believe in "A picture is worth a thousand words" so I strive to take several quality photos of all angles of the actual item you will be receiving. I encourage you to view ALL photographs & use zoom feature for detailed close ups. ALL OUR ITEMS ARE SOLD AS FOUND AS IS WITH NO RETURNS Please read " Item Condition " for detailed condition information. Most of the items we sell are vintage pre owned items so please remember this before buying. Please make payment within 48 hours after auction has ended or Best Offer has been accepted. I will re list all items after 72 hours if buyer has not payed or contacted me about payment. Again PLEASE read item condition & ask any question you may have prior to purchase. Our feedback is set to respond to your feedback. Please contact me prior to leaving neutral or negative feedback. IF YOU ARE UNHAPPY WITH PURCHASE PLEASE CONTACT US BEFORE OPENING A CASE. We can usually work it out without eBay having to step in. We usually ship within 2-3 business days after payment has cleared, but will work with buyers if they contact me prior to purchase. Popularity - 0 views, 0 views per day, 273 days on eBay. 0 sold, 1 available. 0 views, 0 views per day, 273 days on eBay. 0 sold, 1 available. Seller - 3.474+ items sold. 0.4% negative feedback. Great seller with very good positive feedback and over 50 ratings. 3.474+ items sold. 0.4% negative feedback. Great seller with very good positive feedback and over 50 ratings.